Stabilize RZ is a ready to use microbial soil amendment made of multiple proprietary strains of bacillus, brevibacillus and mycorrhizal fungi. Included strains have been selected for their ability to grow in the root zone and rhizosphere of growing plants. These materials interact symbiotically on, in, or close to the root structure where they produce beneficial enzymes and other materials that break down organic and mineral material to be utilized as nutrients by the plant. Stabilize RZ is not a plant food and is not intended to be a plant growth regulator. Stabilize RZ is a liquid concentrate recommended for, but not limited to soil inoculation. Stabilize RZ is compatible with most herbicides, insecticides, fungicides, liquid fertilizers and micronutrients. It is always advised to conduct a compatibility test prior to large scale mixing. Stabilize RZ will disperse easily in water with little agitation. Any residue left in jugs should be rinsed and added to spray tank. Once mixed with other products, mixture should be used within 4 to 6 hours. 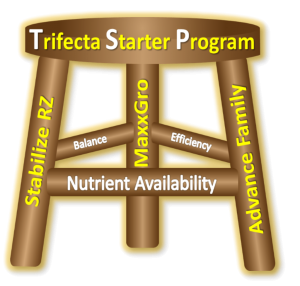 Stabilize RZ may be applied in a number of ways to promote root growth and enhance the solubilization, availability, and uptake of plant nutrients. For best results, Stabilize RZ is designed to be applied as close to the seed germination and/or root zone as possible. Direct in-furrow/injection application is recommended. Stabilize RZ may be applied to the seed furrow at planting as a neat solution or with starter fertilizer recommended for in-furrow or 2 x 2 applications.